Bombay Jayashri, the award-winning vocalist, composer and teacher of music comes from a family that has devoted five generations to music. Under her gurus, TR Balamani and Lalgudi Jayaraman, she trained in Carnatic music and imbibed the nuances of melody. 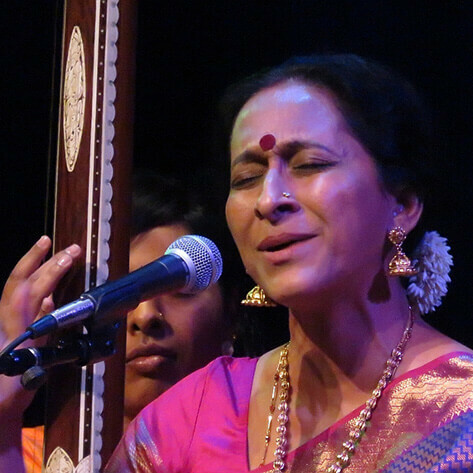 Jayashri also trained in Hindustani music under Mahavir Jaipurvale and Ajay Pohankar. Bombay Jayashri has performed at festivals and concerts in more than 35 countries. Her compositions amalgamate classical Carnatic music with our rich legacy in literature and other art forms. She believes in experimenting and fusing different genres and forms, diving into both World Music, and the music of film soundtracks of India. Jayashri’s experiences with the power of music have motivated her to start Hitham, a foundation which works to share music with autistic children and those from rural background in Tamil Nadu; exploring the therapeutic value of music in the lives of special children. Today, Jayashri composes, performs, writes and teaches music, expanding the modern understanding of our common heritage of music.